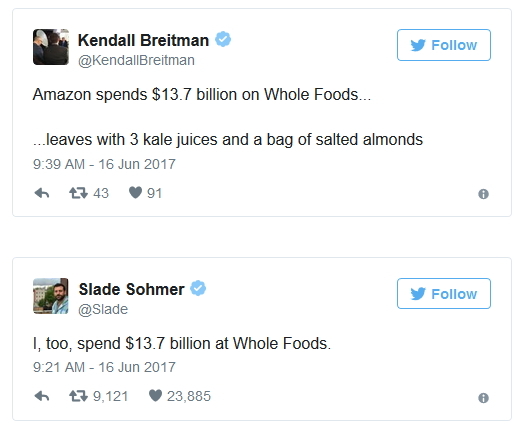 Amazon announces acquisition of Whole Foods for $13.7 billion – a purchase that means now even Jeff Bezos can call Whole Foods by its unofficially official name, Whole Paycheck (Tweet This). News of the sale prompted Wal-Mart to table their plans to make an offer on the niche grocery chain and, of course, the public has been quick to weigh in on their own take about the buy-out. Humor aside, people are already wondering what this will really mean for two companies so seemingly at odds with one another and beyond. How will the merger affect each company? What will it mean for other grocery chains? And will Amazon change the way we shop for food in the same ways it has changed the way we shop for just about everything else? Amazon got its start as the company no one was betting on. When Amazon launched in 1994, online shopping had more cynics and critics than it did fans or regular shoppers. Articles and news pieces criticized everything from how removed people were from the item they were buying (“Who’s going to buy clothes without being able to try them on first?”) to the wait it took to have it shipped to your home, days – or even weeks – after you made the purchase. In fact, Amazon operated at a loss for the first several years of its existence, but that was by design. Jeff Bezos never intended Amazon to turn a profit in the first 5 years. He knew he would be running in the red; the company living essentially quarter to quarter. There were enough investors to keep him afloat – men and women willing to take a risk on an idea that Bezos thought would grow into the world’s largest company. After all, Bezos had named the company Amazon because he felt it was “wild and exotic” as well as being the namesake of the world’s biggest river – all attributes he envisioned for the future of Amazon. In the end, Amazon’s profitless business plan stretched a bit beyond Bezos’ 5-year plan. The company turned its first profit in the final quarter of 2001 – a full six years after the company went live and sold its first book (Douglas Hofstadter’s Fluid Concepts and Creative Analogies: Computer Models of the Fundamental Mechanisms of Thought) in October of 1995. Since then, however, the company has grown by leaps and bounds. In the beginning, Amazon sold books and a few titles in other forms of entertainment such as CDs and video tapes. Today, Amazon still sells books but they have branched out and now sell just about anything you can imagine; from toilet paper and paper plates to kayaks and smart TVs. While there are often mergers and buy-outs between companies that only matter behind the scene to investors and employees, people are watching this buy-out with a greater sense of interest. The question is about more than just what it will mean for stocks or how it will affect the already solid customer base for each company. How will Amazon, a company known for slashing prices and making the uncommon common, mesh with Whole Foods, a company that prides itself on catering to a niche market? And how will a company known for revolutionizing online shopping change the grocery industry? Amazon has moved far beyond its humble beginnings as a cut-rate bookshop and, later, a general mass merchandiser. Today they sell a bevy of products from cribs to coffins and everything in between. With this acquisition of Whole Foods, a person could easily live their entire life only purchasing things strictly from Jeff Benzos’ brainchild. The Amazon Prime program is perhaps the best illustration of how far Amazon has come as well as how far they reach into the average person’s life. According to a report from Consumer Intelligence Research Partners (CIRP), Amazon Prime boasts roughly 80 million households, roughly 60% of households in the country. The program gives members faster and free shipping options from Prime items, access to a slew of music, TV shows and movies through Amazon video, discounts on purchases made monthly through the website and cheaper prices on items like the Amazon Dash Wand – a voice-controlled widget you can stick to your fridge to make online ordering and research simple, easy, and a part of your daily routine. Through the device you can also check recipes, order ingredients, tack on some paper goods and then rent the latest release to watch later on your Amazon Video enabled smart TV. Amazon has essentially become the General Store and hub of communications and planning for many families – so why shouldn’t they also become the company that feeds us as well? A bigger concern is the effect this union may have on Main Streets across the country. When Amazon needed to improve shipping speeds and performance they developed their own shopping arm, Amazon Logistics, along with its own shopping company, Amazon Maritime, for international transportation. Then there’s their cloud-computing platform, Amazon Web Services, which not only improves their own performance, but they license out for use to companies and organizations like Netflix, NASA, and the CIA. Amazon has a history of changing every industry it touches. They changed the way people shop and the way companies work online. Their online marketplaces, payment systems, shipping options and advertising has been copied so often, it’s become what we expect from a company. They have fueled a change in how people view online shopping, creating a world where ordering things online is often seen as easier than going to the store. Therein lies the concern for many people on the front lines of any sort of retail business. There was a time when we couldn’t imagine buying goods like clothing or furniture without being able to see it in person first. Now, these purchases are routinely made online. If Amazon is able to effect this same change when it comes to our comfort in buying groceries, what will that mean for local grocery chains? 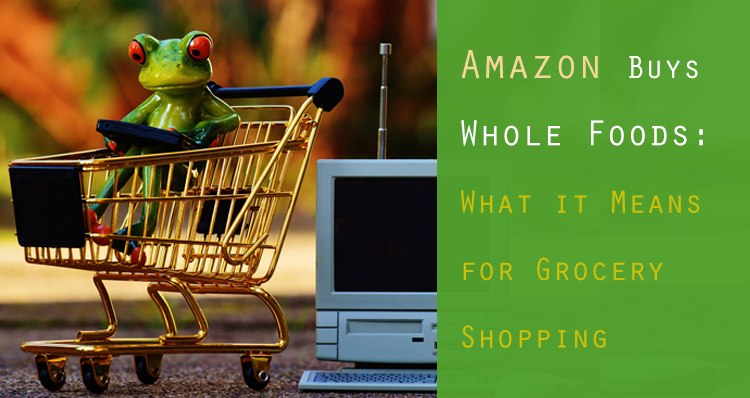 What will the Amazon – Whole Foods merger do to grocery stores? Grocery stores run on a notoriously thin profit margin – thin as in razor thin, the average is 1%. In an industry with such thin profit margins, competition is fierce and the buying, shipping and logistical power Amazon wields could easily become a game changer. If Amazon does for grocery shopping what it has done for other forms of shopping, how long before grocery stores become specialty shops, how long before we’re telling our kids about the days when we had to physically go to the store to buy milk instead of asking Alexis to add it to tomorrow’s Prime order? If Amazon succeeds in making the Clicks to Bricks transition of having physical shops to complement and expand their online empire, they could easily achieve their goal to become the world’s largest company (a position currently held by Wal-Mart). And, of course, let’s not forget Whole Foods itself. Having the flagship store of hippies being bought by a megacompany appears, at first glance, like a bizarre match. But, for others, it’s the natural evolution of the Whole Foods story – with perhaps a bit of karmic retribution thrown in for good measure. For the past 22 years, Amazon has worked to create, develop, hone and tweak the fine art of instant ordering – and near-instant gratification – for a huge range of both durable and consumable goods. While Whole Foods may have a crunchy granola image and even a heartwarming backstory, the truth is that the company grew because it knew how to acquire and absorb other, smaller companies along the way. It’s true that Whole Foods was started by a young man who wanted to create a great vegetarian and health food store. When Mackey and Renee Lawson invested $45,000 they had borrowed from family and friends, the vision had been for a high-quality vegetarian store. Later they merged with local health food store Clarksville Natural Grocery and Whole Foods was born. From there, Whole Foods did more than simply open new stores – they bought up smaller health food markets and then rebranded them in the Whole Foods image. So, having Whole Foods bought up and absorbed by Amazon makes a lot of sense for each company. They’ll each grow, broadening their customer base and further enmeshing themselves into our everyday lives as well as our pop culture. The future has arrived, and it will be delivered fresh and ready to eat by Amazon.